The number of men behind bars in the US is mind-boggling. 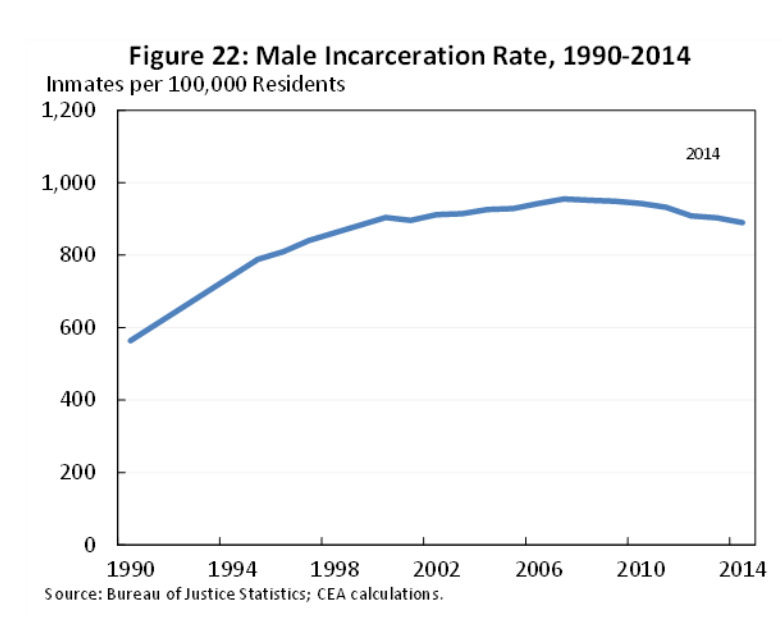 In a hefty report on the long-term decline in the prime-age male labour force participation, the White House’s Council of Economic Advisors shared a few charts that show just how stunning America’s incarceration rate is. 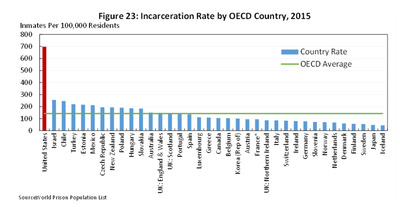 The United States has the highest incarceration rate out of any OECD country at about 700 inmates per 100,000 residents, according to data from the World Prison Population List — which is about five times the OECD average. By comparison, the next closest state is Israel, whose incarceration rate is about 250 inmates per 100,000. 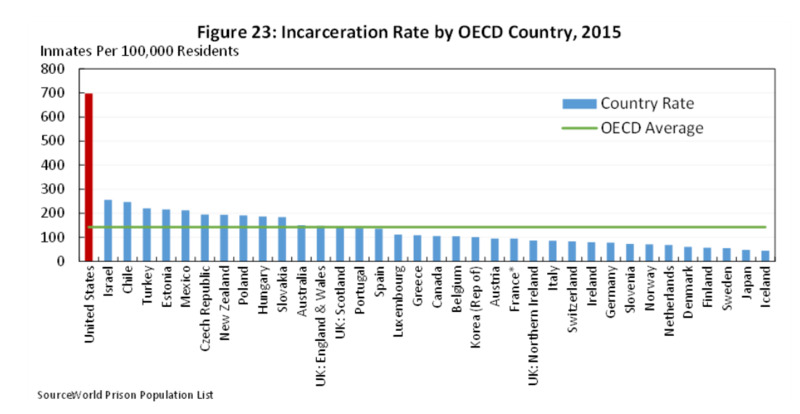 Plus, the US also has the highest share of its population in prison aside from the Seychelles, according to the CEA. 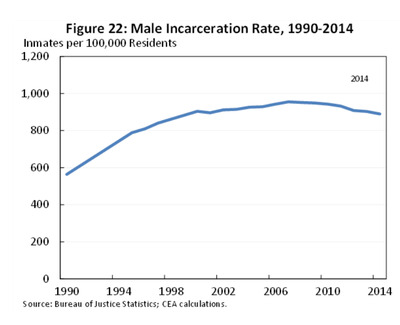 Moreover, the number of men incarcerated has increased dramatically over the last 25 years. Data from the Bureau of Justice Statistics shows that the rate has grown from 564 per 100,000 in 1990 to 890 per 100,000 in 2014. Notably, this spike is correlated with the War on Drugs. The big takeaway here is that these high incarceration rates are likely to have contributed to the US’ decline in prime-age labour force participation rates relative to other countries. “Incarceration policies affect participation rates directly by removing workers from the labour force for a period of time but also long-term as the stigma of incarceration can reduce demand for the labour services of the formerly incarcerated even years after their reentry into society,” the authors noted in the report. The CEA points out that, in many states, occupational licensing rules or other restrictions on the hiring of those who have been incarcerated legally bar such individuals from a number of jobs. And, even when there aren’t legal restrictions, employers are less likely to hire someone with a criminal record, according to a 2007 paper by Georgetown University’s Harry J. Holzer. There are no official statistics on the share of the population that is formerly incarcerated, but the CEA suggests that given the large increase in incarceration rates, one can assume that there’s also an increase in those who were incarcerated.